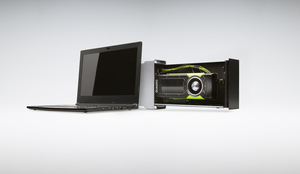 LOS ANGELES, CA--(Marketwired - Jul 31, 2017) - SIGGRAPH 2017 - NVIDIA (NASDAQ: NVDA) today announced that 25 million artists and designers can now easily upgrade the capability of their notebooks to support new workflows such as video editing, interactive rendering, VR content creation, AI development and more. Creative professionals with underpowered graphics can now harness the power of NVIDIA TITAN X or NVIDIA Quadro® graphics cards through an external GPU (eGPU) chassis and dramatically boost the performance of their applications. "While more computer power than ever is needed for VR, photoreal rendering and AI workflows, mobile systems are getting thinner and lighter, with limited performance and memory," says Bob Pette, vice president, Professional Visualization, NVIDIA. "Our eGPUs can now solve this problem, enabling creatives to plug into our most capable GPUs so they can do their best work on the most graphically demanding applications." 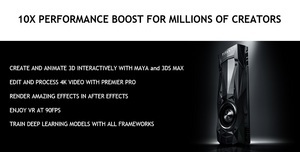 To ensure prosumers enjoy great performance with applications such as Autodesk Maya and Adobe® Premier Pro, NVIDIA is also releasing a new performance driver for TITAN X to make it faster than ever before. Available starting in September, Quadro eGPU solutions will be available through qualified partners such as Bizon, One Stop Systems/Magma and Sonnet with more to come. NVIDIA is at the SIGGRAPH ACM computer graphics conference, at the Los Angeles Convention Center, demonstrating new capabilities and performance enhancements that can be achieved with Titan Xp drivers and new qualified Quadro eGPU solutions. Stop by booth #403 for a hands-on demo. NVIDIA's (NASDAQ: NVDA) invention of the GPU in 1999 sparked the growth of the PC gaming market, redefined modern computer graphics, and revolutionized parallel computing. More recently, GPU deep learning ignited modern AI -- the next era of computing -- with the GPU acting as the brain of computers, robots, and self-driving cars that can perceive and understand the world. More information at http://nvidianews.nvidia.com/. Certain statements in this press release including, but not limited to, statements as to: the benefits, impact and availability of NVIDIA eGPUs; and the impact of eGPU partner qualification are forward-looking statements that are subject to risks and uncertainties that could cause results to be materially different than expectations. Important factors that could cause actual results to differ materially include: global economic conditions; our reliance on third parties to manufacture, assemble, package and test our products; the impact of technological development and competition; development of new products and technologies or enhancements to our existing product and technologies; market acceptance of our products or our partners' products; design, manufacturing or software defects; changes in consumer preferences or demands; changes in industry standards and interfaces; unexpected loss of performance of our products or technologies when integrated into systems; as well as other factors detailed from time to time in the reports NVIDIA files with the Securities and Exchange Commission, or SEC, including its Form 10-Q for the fiscal period ended April 30, 2017. Copies of reports filed with the SEC are posted on the company's website and are available from NVIDIA without charge. These forward-looking statements are not guarantees of future performance and speak only as of the date hereof, and, except as required by law, NVIDIA disclaims any obligation to update these forward-looking statements to reflect future events or circumstances. © 2017 NVIDIA Corporation. All rights reserved. NVIDIA, the NVIDIA logo, and Quadro are trademarks and/or registered trademarks of NVIDIA Corporation in the U.S. and other countries. Other company and product names may be trademarks of the respective companies with which they are associated. Features, pricing, availability and specifications are subject to change without notice.